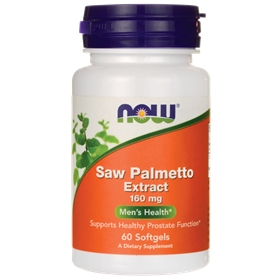 The action of saw palmetto has been well studied, and the herb is popular in the treatment of prostate enlargement. Enlargement of the prostate gland affects millions of men older than 50 years of age, causing difficulty with urination and a sensation of swelling in the low pelvis or rectal area.Research has shown that saw palmetto inhibits one of the active forms of testosterone in the body (dihydrotestosterone) from stimulating cellular reproduction in the prostate gland. Saw palmetto inhibits testosterone from binding to and thereby stimulating prostate cells. This serves to reduce multiplication of prostatic cells and reduces prostatic enlargement. Saw palmetto is recommended to treat weakening urinary organs and the resulting incontinence that may occur in elderly people or women after menopause. Saw palmetto strengthens the urinary organs and has been recommended for kidney stones.